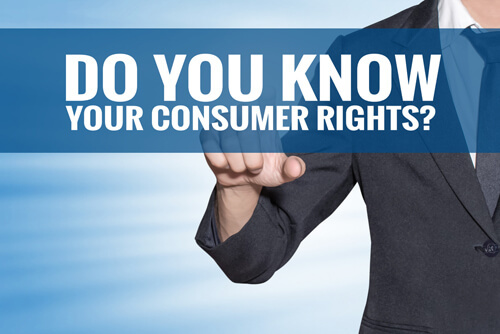 The Consumer Bill of Rights - First Enacted in 1962 | The Consumer Law Group, P.C. Consumers have the right to protection against products that have caused physical harm (excluding automobiles). This right to safety would be further fomalized in 1972 by the creation of the Consumer Product Safety Commission, an organization that has the authority to establish performance and safety standards, as well as require product testing and warning labels. Consumers must be given free choice when it comes to choosing products and services offered by various companies. This right is typically manifested in measures such as limiting concept ownership via patent law, preventing monopolies with anti-trust legistlation, and outlawing the practices of price gouging and cutting. Consumers have the right to voice their complaints and concerns against compnay practices and products. Today, state and federal attorney generals aid the people in dealing with an unsatisfactory product or service that violates the law. Additionally, the Better Business Bureau plays a similar role by providing an outlet for consumer complaints.